WHO WILL BENEFIT FROM THIS RESOURCE? !This resource is perfect for students who need to practice and/or improve their reading fluency. Whether or not you specifically use Fry Words in your instruction, ALL students will benefit from the provided exposure and repetition to these frequently used words. WHO WILL BENEFIT FROM THIS RESOURCE?! 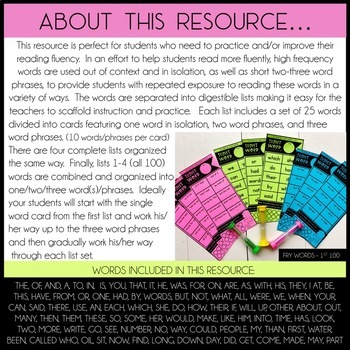 This resource is perfect for students who need to practice and/or improve their reading fluency. Whether or not you specifically use Fry Words in your instruction, ALL students will benefit from the provided exposure and repetition to these frequently used words. WHAT IS THIS RESOURCE ALL ABOUT? In an effort to help students read more fluently, high frequency words are used out of context and in isolation, as well as short two-three word phrases, to provide students with repeated exposure to reading these words in a variety of ways. 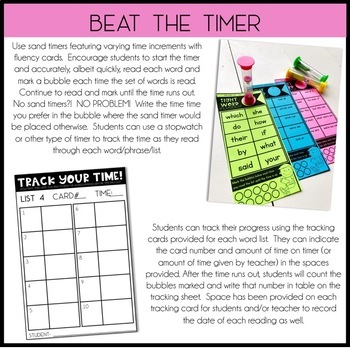 Students will repeatedly practice and read the words/phrases on the cards included to help improve their retention and automaticity, thus improving their reading fluency. divided into cards featuring one word in isolation, two word phrases, and three word phrases (10 words/phrases per card). There are four complete lists organized the same way. Finally, lists 1-4 (all 100) words are combined and organized into one/two/three word(s)/phrases. Ideally your students will start with the single word card from the first list and work his/her way up to the three word phrases and then gradually work his/her way through each list. Click the PREVIEW button for a closer look at this resource. 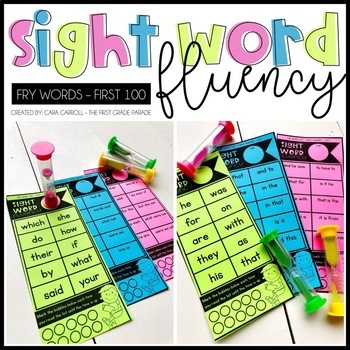 Looking for MORE sight word resources?! Check out what teachers are saying about these!